When I met with Sam* that Thursday, we had talked about going to Paradise Bakery for lunch. She was craving all things sweet during her pregnancy, especially brownies, and we felt this was a casual place we could get lunch, talk, and of course – get brownies. We spent the first hour and a half just talking about whatever conversation came up. We learned about Z’s history and Sam’s* dreams. We listened to stories about Sam’s* childhood and learned all about what she was like as a little girl. Z shared some personal and heart wrenching stories with us, that made us appreciate their situation all the more. After lunch was finished and conversation was starting to dull, I pulled the trigger and asked if I could share with them the photo book I had put together and if A could share his letter with them so they could learn more about us. We flipped through the story book telling the story behind each picture. We showed them photo’s of my parents and told them about how my mom earned to be a Grammy with every bone in her body. We told them about our annual family vacations to Disneyland, letting them know that our children would “meet the mouse” at a young age. We showed them our house where our children will grow up. As A would say, “I did my thing”. Really, I just told them the story of us. 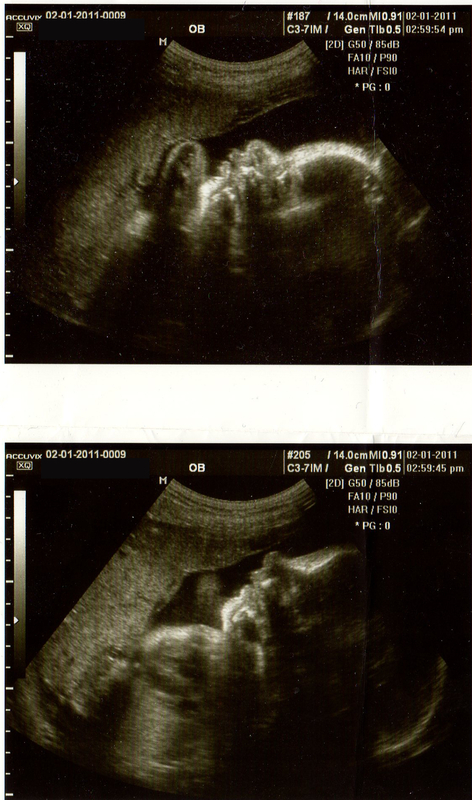 Z handed us the ultra sound photo’s they had received from a previous doctor’s appointment, and said the most amazing words ever, “Believe it, she’s yours”. For the first time in years, we had 2 solid blue lines. We were having a baby. Aww, so touching! That almost made me cry!